It will be a rare, white Christmas for us this year. The interstates are closed. Stranded motorists – in route to Christmas gatherings or doing last-minute errands — are waiting for the National Guard. Closer to home, no buses are running up and down Walker Avenue. No cars are skating the slippery side-streets. I’ve swept snow off my porches more times than I can shake a broomstick at. I’m guessing ten to twelve inches so far. The internet is down and snow continues to fall. We are cut off. We are set apart from the rest of the world by snow. We are living in a Christmas song. Yet all is not calm. Nor is it bright. Ever so often the wind howls. Snow puffs up and curls like smoke from rooftops. If it were not for that occasional gust of wind, it would be silent. I feel as is we are living a quiet country life on the edge of downtown. It’s odd to be living in a silent night rather than singing about it at Christmas Eve church service. And it’s strange to be living a White Christmas rather than dreaming it through song. 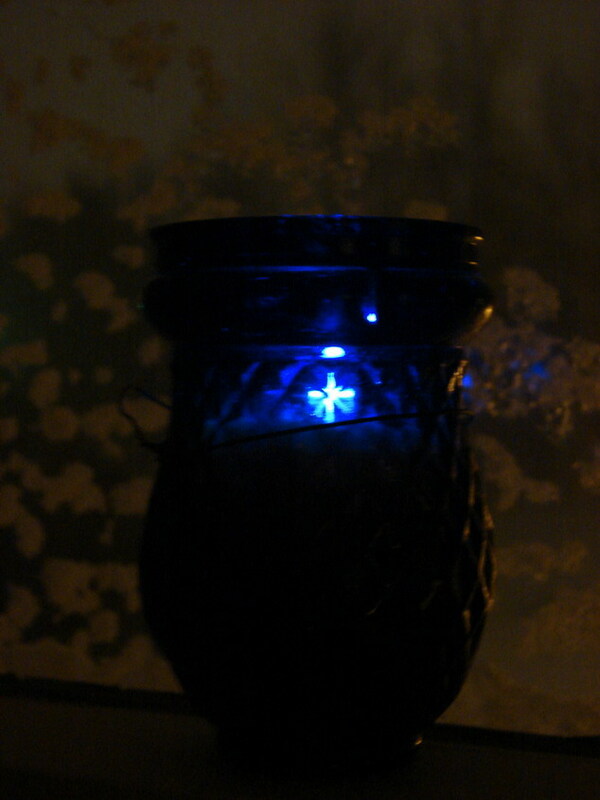 But the unexpected gift of a White Christmas is firmly on my doorstep, no matter how many times I try to sweep it away. For years I’ve dreamed of gathering family around a Christmas brunch. This was to be my year. But what was to be brunch for twelve will be brunch for three. Several of the dishes – a breakfast casserole and my Aunt Jo’s pull-apart coffee cake – will be made tonight. 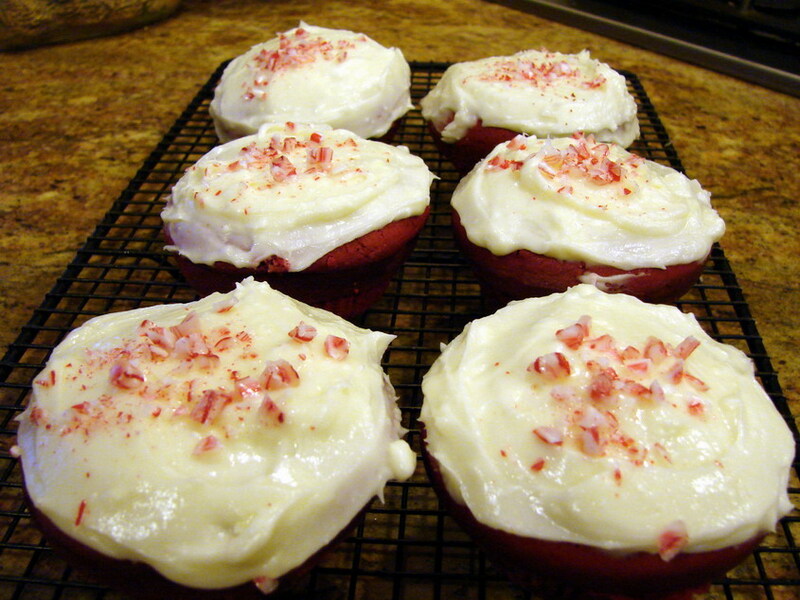 Earlier today I baked a dozen Red Velvet Cupcakes with peppermint cream cheese frosting. The rest of my menu — the blackberry blue corn muffins, the cinnamon rolls, the brown-sugar bacon, the pancakes – will keep for another brunch. Some day. 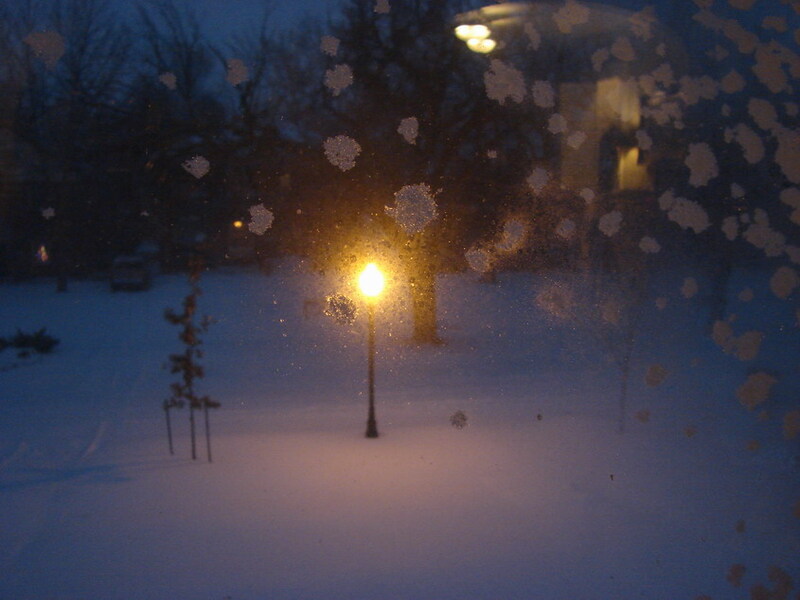 For now, my unexpected guest is the snow that has come. It has closed roads and canceled many gatherings in its path to get here. Yet, my story is not about a Snow-Grinch stealing away my Christmas brunch dreams. Christmas will come whether we gather at church or around a dreamy brunch. Christmas is full of miracles no matter how it comes wrapped. I’m living in a beautiful Christmas greeting card. And from where I sit all snug and warm, it’s a fine place to worship Christ and new birth, against a landscape frosted in un-driven snow. As you can see…my candle it lit, without need of church. The truffles are good but very rich. You are brave to get out on these roads. A snow plow just made it past my house up Walker Avenue, so the streets are beginning to show life after the storm. Don walked down to Bricktown this morning taking photos of a city that he said looked hit by an Apocalypse. Buses horizontal on major streets, cars this way and that — no signs of human life anywhere. He thought about driving but then decided he’d be safer on foot. He was gone for two hours. The cupcakes are not as good as they are pretty. I bet we could make red cheesecake cupcakes though. Let’s try this for Valentines.